Vasiliy Lomachenko's +18.1 plus/minus rating is #1 among active championship caliber fighters. Loma landed 47.2% of his power punches- nearly 12% higher than lightweight averaged. Loma landed 7.7 jabs per round, well above the lightweight average and #4 among champ. caliber fighters. Loma opponents landed just 17.2% of their total punches- #2 among champ. caliber fighters and 12% lower than lightweight avg. Anthony Crolla averaged 66.6 punches thrown per round. Nearly half of Crolla's landed punches are body shots - only 17.5% of Loma's landed punches are body shots. (CompuBox avg. : 28%). Crolla landed 9.3 body shots per round - double the CompuBox average. 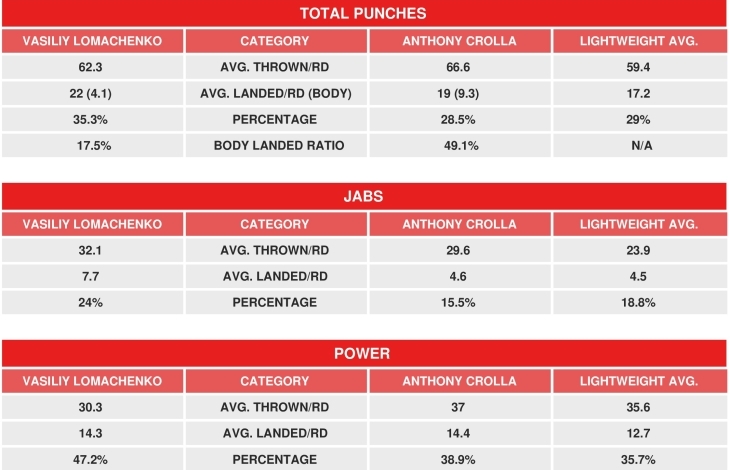 Crolla opponents landed 34% of their power punches.